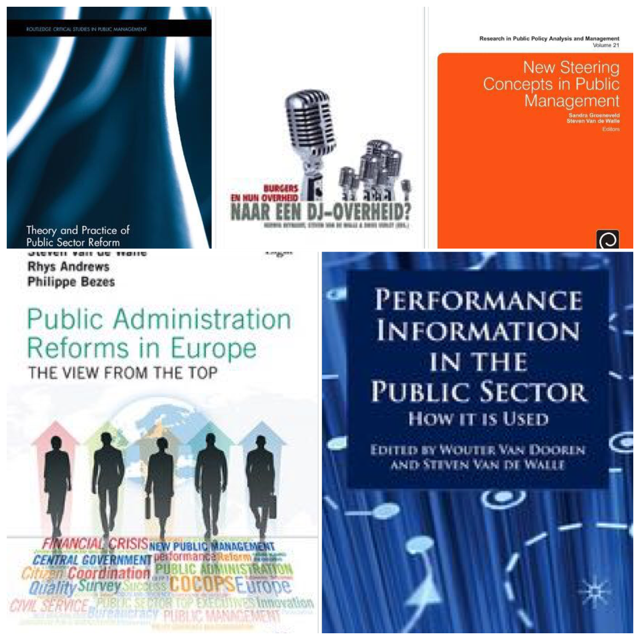 My research covers a range of public administration and public management topics, but in all of these, tensions between bureaucracy and democracy take a central role. Below are some recent projects. CITADEL(H2020) – Empowering Citizens to Transform European Public Administrations. In the CITADEL project we study civil servants´willingness to engage with citizens. We use survey vignettes to study design features of participation modes. TROPICO (H2020) – Transforming into Open, Innovative and Collaborative Governments. TROPICO is an international research consortium investigating how public administrations are transformed to enhane collaboration in policy design and service delivery, advancing the participation of public, private and societal actors. The Leuven team will look at collaborative behaviours of civil servants. Coordinating for Cohesion in the Public Sector of the Future. The COCOPS project (2011-2014) was funded under the European Commission’s 7th Framework Programme. I coordinated this 11-university consortium to study the impact of NPM-style reforms in European public administrations. Public attitudes towards public services and public opinion towards the public sector. In this research we look at determinants of citizen attitudes towards the public sector, and at measurement issues. Special attention goes to attitudes towards (liberalised) services of general interest. Previous research includes attitudes towards local government, confidence in the justice system and satisfaction surveys in government. Trust in government. We are looking at drivers of citizen trust in government, and at longitudinal trends in trust. This line of research is furthermore looking at differences across countries, and at measurement issues. Some specific areas of current research include differences between active trust and active distrust, and question order effects. Data and questionnaires from the Belgian trust project (‘Werken aan de Overheid’) are available here. Trust in the police. A project funded by the Dutch programme ‘Politie en Wetenschap’. We analyse survey material on public trust in the police in the Netherlands. Privacy in government data. An analysis of access to (National) Electronic Patient Records, through an international comparison of regulation, and an analysis of access practices and audit procedures at local level. Social justice in the allocation of scarce public services. Building on the work of Jon Elster and others, we are looking at the mechanisms used to allocate scarce public services in real-life policy settings. Through a combination of vignettes and surveys (planned for late 2010), we are looking at the factors determining whether or not certain mechanisms are seen as just in a specific service delivery context. The case is the allocation of child care places in the Rotterdam area. Diversity and representative bureaucracy, and more specifically multilingualism in public services, with a focus on multilingual practices at street level. Secondary interests include citizen charters, quality management, administrative history, administrative discretion and citizen participation.